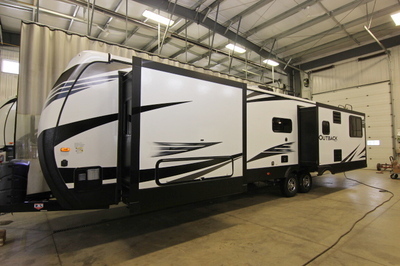 Note:- 360 View May May Differ From Actual Inventory. 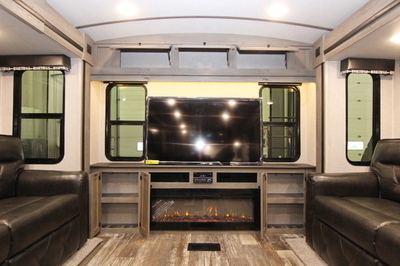 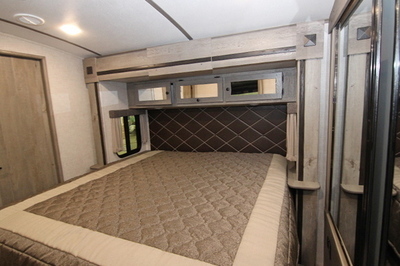 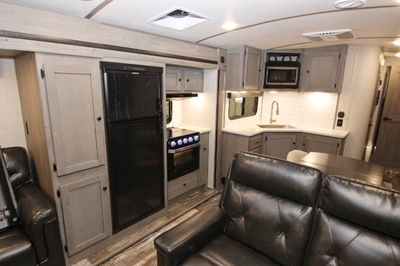 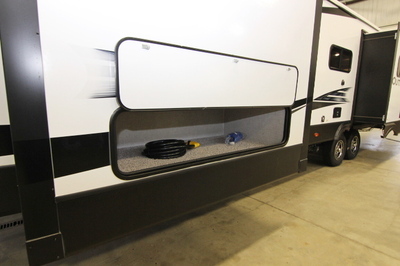 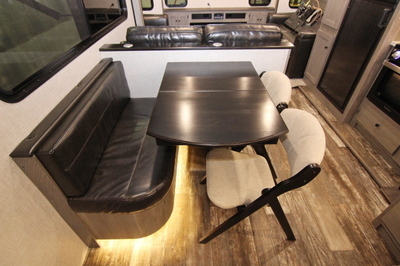 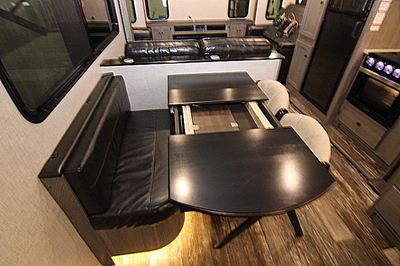 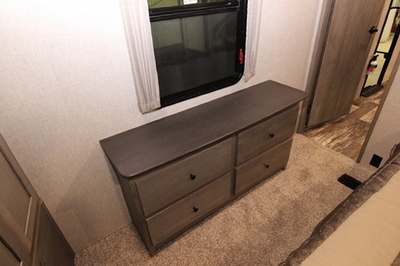 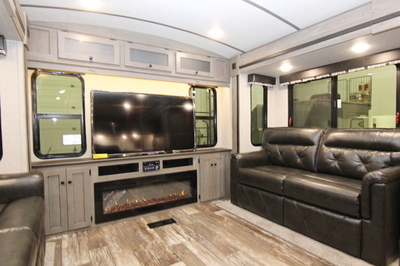 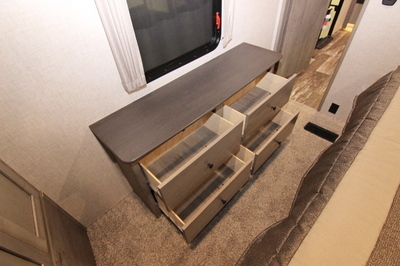 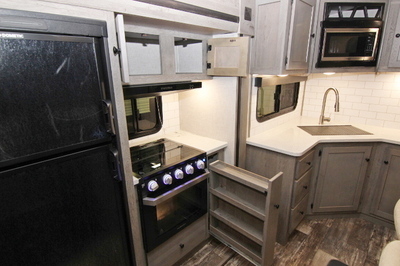 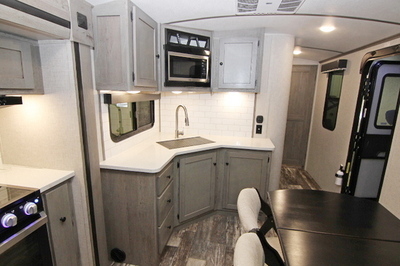 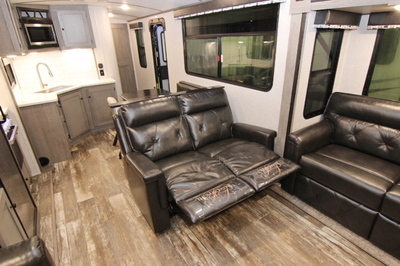 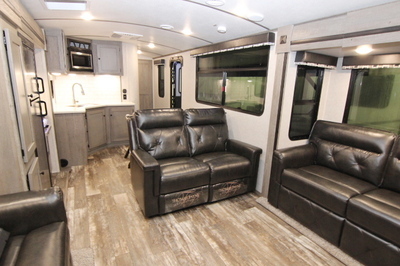 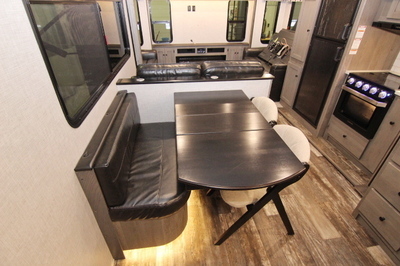 Packages and Upgrades Included with this Unit:- Comfort Package, Premium Package, BAL 5.1 Stabilization System, 2 Tri-Fold Sleeper Sofas, Unique Corner Dinette, Fireplace, Built-In Pet Kennel. 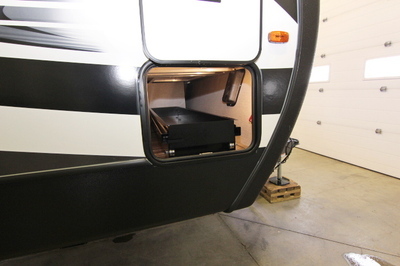 Premium Package:- Polar White High Gloss Exterior Fiberglass, Full Fiberglass Front Cap w/Rock Guard,Slam Pass Thru Baggage Doors, Rear Max Cargo Rack, LP Cover, MORryde Steps,Black Tank Flush, Radial Tires w/15” Spare, Aluminum Wheels, LED Lit Power Awning, XL Entry Handle, Omni Directional Antenna, Exterior Convenience Utility Center, Heated and Enclosed Underbelly w/Designated Heat Duct to Subfloor,Moisture Barrier Floor Enclosure, Hi Density Roof Insulation w/Attic Vent, Walk on Roof. 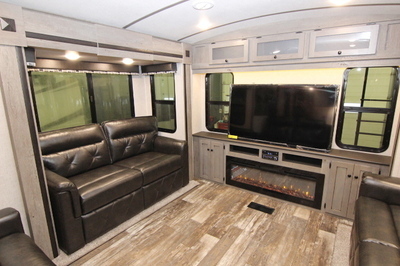 Living Area:- Upgraded Furniture Package, Hand Glazed Mystic Maple Cabinetry, Lounge Dinette, 36" Flush Floor Slides, Large Panoramic Windows,Pre-drilled and Screwed Cabinetry, Custom Designed Box Valance with Soft Curtains,Linoleum Flooring, Large Wood Side Drawers with Steel Guides, Water, Soil,Stain Resistant Fabrics, Large Overhead Cabinets, HD TV, MCD Roller Shades,Vaulted Ceiling, Floor Lights (2), USB Charging Port, LED Lighting, Batten Ceiling Accent, Hide-a-Bed Sofa-Sleeper. 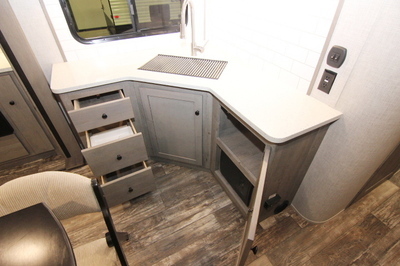 Kitchen:-Single Basin Sink with 3'' Drains, Trash Can Storage, Two Door 8 cu. 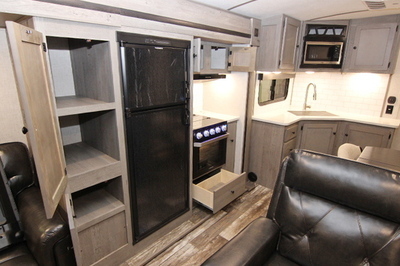 ft. Refrigerator,High-Rise Faucet w/ Pullout Sprayer, Utensil Tray, 3 Burner Range with Oven, Microwave,Upgraded Laminate Countertops, Stainless Steel Appliances, Skylights over Islands. 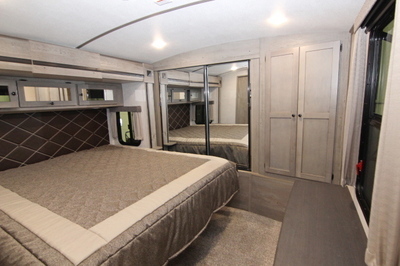 Bedroom:- Deluxe Innerspring Mattress, TV Hook-Up, Jalousie Windows for Maximum Ventilation,Residential Bedspread, Deluxe Headboard, His and Her Lights, Bedroom Speakers,2 Full Length Wardrobes, Recessed Cubby Storage w/110 Volt Outlets (most models), USB Charging Port, Washer/Dryer Prep (326RL, 328RL, 330RL). 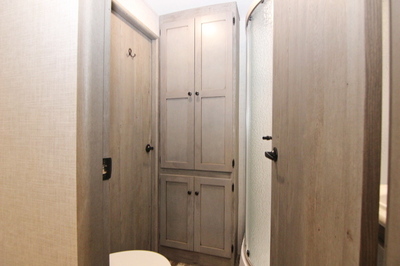 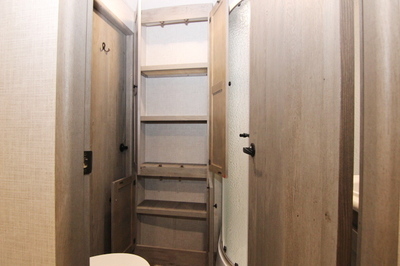 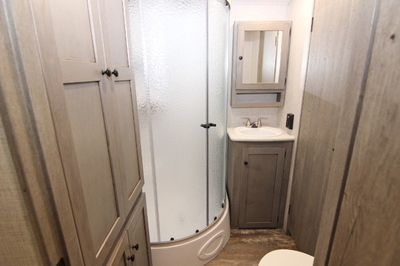 Bathroom:- Power Roof Vent, Skylight over Tub, Porcelain Foot Flush Toilet, Tub Surround, Radius Shower (N/A 266RB, 312BH) Deluxe Medicine Cabinet, Large Linen Closet (most models). 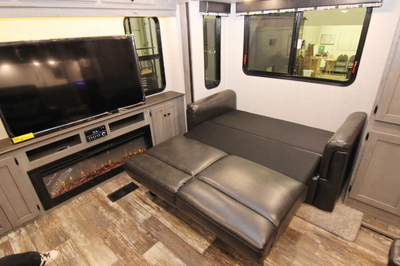 Appliances:- Stainless Steel DVD Player with Bluetooth Remote Control App, Two Door 8 cu. 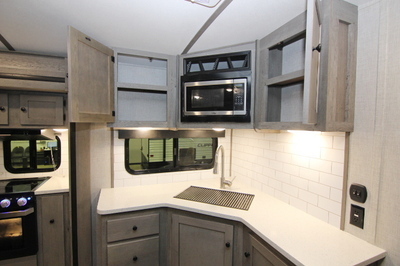 ft. Refrigerator(326RL/328RL Only), 3 Burner Range with Oven, Six Gallon Gas/Electric DSI Water Heater Bypass with 16.2 Gallons per hour Quick Recovery, 15,000 BTU AC, Wall Thermostat,30,000 BTU Furnace, Microwave. 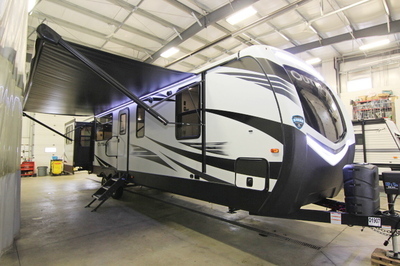 Exterior Standards:- Painted Fiberglass Front Cap w/LED Strip Lights and Rock Guard, Black Framed Tinted Jalousie Safety Glass Windows, Black Tank Flush, Assist Entry Grab Handle, Extended Drip Caps and Full Length Drip Rail,Security Light (off door side), Porch Light, Hitch Light, Step Light, Weather Encapsulated Body Trim, Exterior 120V Receptacle, Heated Enclosed Underbelly,LP Tank Cover, Automotive Style Fender Skirts, Double Welded Dual Battery Brackets,Exterior Speakers, Easy Lube Axles, Outside Camp Kitchen (most models),Exterior Quick Connect LP Hook-Up, LED Hitch Lights, Satellite Prep, Slam Latch Baggage Doors w/ Magnetic Door Holders, Rear Ladder (N/A 335CG), Power Tongue Jack,Black Slide Out Endwalls, Water Docking Station, Power Stabilizer Jacks,Aluminum Entry Steps, Friction Hinge Entry Door, Rear Max Cargo Rack, PanaView Patent Pending Windshield (332FK, 333FE), 5.1 Auto Leveling System, Battery Disconnect. 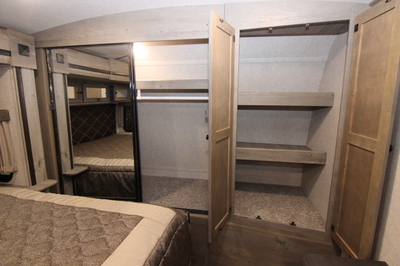 Walls:- Welded Aluminum Walls with R7 Insulation, Solid Block Foam Insulation. 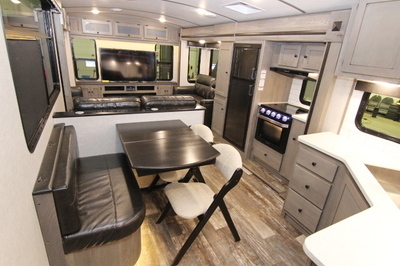 Roof:- 5" Radius, Vaulted Galvanized Steel, Tapered Trusses on 16" Centers, 3/8'' Roof Decking,One-Piece TPO Roof, R14 Blanket Insulation. 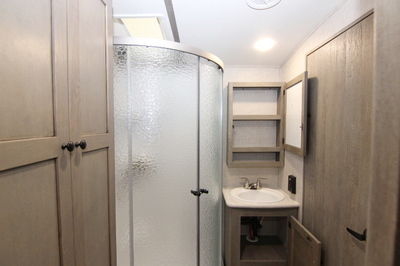 Floor:-2'' Welded Aluminum Laminated Floor, R10 Block Foam Insulation, Wrapped Vapor Barrier,Polypropylene Enclosed Heated Underbelly Encloses Tanks and Valves. 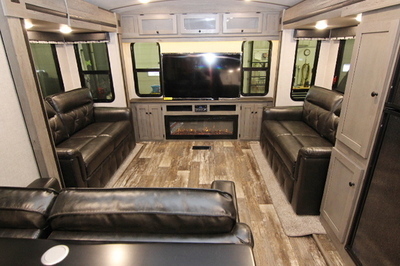 Chassis:- Leaf Spring Equalizing Suspension System, Powder Coated I-Beam, 10" Electric Brakes, 15'' Radial Tires, 15'' Spare Tire, Carrier & Cover, Aluminum Rims. 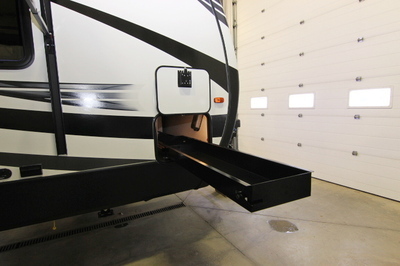 Utilities:-75-Amp Converter, 30 lbs. 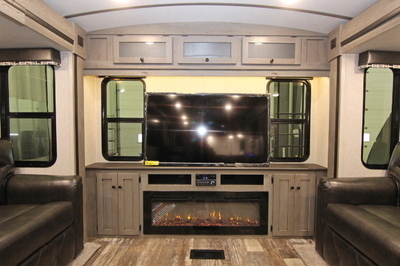 LP Bottles with Auto Changeover, Omni Directional Hands-Free TV/Radio Antenna, 50-Amp Shore Power Line, LP Leak Detector, Smoke Detector,Carbon Monoxide Detector, Fire Extinguisher, Tinted Safety Glass Windows,Break-Away Switch, Safety Chains, Manual Slide Backup on all Electric Slide Outs,12 Volt Battery Disconnect, Carbon Monoxide Detector, RVIA, Radial Tires, 15''Spare Tire, Carrier and Cover, Aluminum Rims.